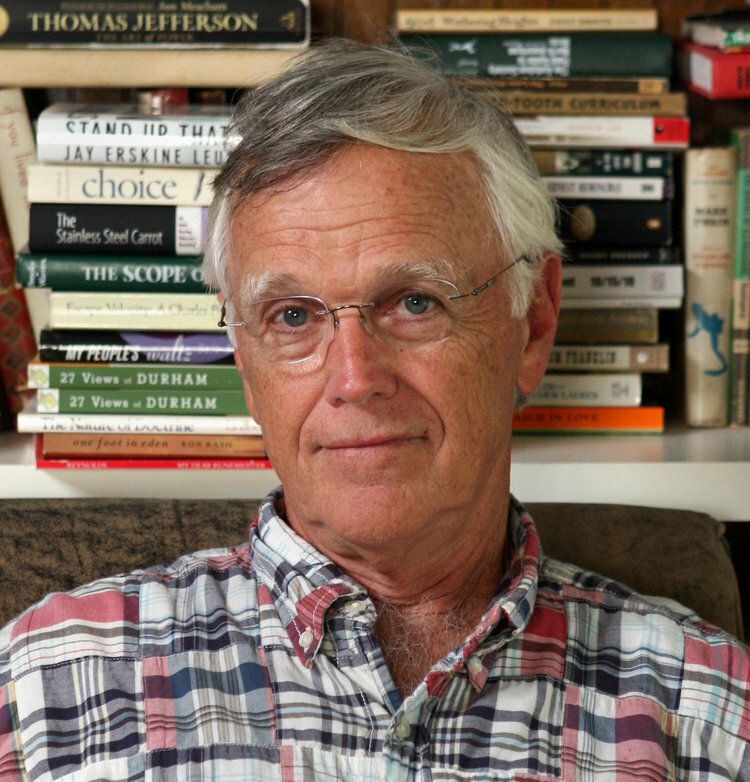 Author Clyde Edgerton photographed at his home in Wilmington, North Carolina. Clyde Edgerton (b. 1944) was born in Bethesda, North Carolina. In the 1940s and 50s and 60s, the community consisted of a crossroads at Miami Boulevard and Angier Avenue, with a single blinker light, a few stores (one run by his uncle and his father), a Southern Baptist church, a school, and woods all around. There were a few black families on the outer edges of this white community. Clyde has written about fictional versions of this community in most of his novels. If a fictional community is called Listre, Summerlin, Bethel, or Starke, then true aspects of his home community exist in those fictional places. Bethesda was relatively flat in terms of sociological structure. There was not a wealthy class, a middle class, and a poor class. It felt like most of the 300-500 white folks in Bethesda were nestled between middle and poor, and the black folks were mostly poor, given the racism that hounded the community. Clyde’s parents grew up relatively poor—no bank accounts, etc. But there was plenty of good food from gardens, and deep family bonds that often form when cooperation and harmony supports actual survival on a small farm. And of course there was the structure of white privilege in his southern culture that allowed white upward mobility at a rate and with an ease not available to most blacks living nearby. In 1962 he entered the ROTC. He went to war a “naive, idealistic, and ignorant young man” and returned “disillusioned” about abuses of power committed by many Americans. He wrote obliquely about his war experience in his third novel, The Floatplane Notebooks, and more directly in his first nonfiction book, Solo: My Adventures in the Air. He has taught at the University of North Carolina at Wilmington since 1998. As well as being a New York Times bestselling author, Clyde is an accomplished artist, musician, and pilot. Funny and tragic family stories on both sides of his family, but especially on his mother’s, were gifts to his profession as a fiction writer—and thus helped him make a living on earth, a living that he has thus far enjoyed immensely. Courtesy of CBS This Morning. Courtesy of the University of North Carolina at Wilmington.